Homepage Text: Histology is the study of microanatomy. Photomicrographs are photographs of microscopic images. With an emphasis on musculoskeletal structure, my work focuses on showcasing the beauty of vertebrate and invertebrate microscopic anatomy. The color and structural highlights, observed in my photomicrographs, are a combination of biological staining and microscopy technique. The images in this collection are natural and without retouching. Images: Carpenter's Vision - Portrait of compound eye morphology of a Carpenter Ant.OMMATIDIUM - Pigment cells and lens from the compound eye of a Honeybee.ELYTRA - Chitinous forewing of a beetle.EPITHELIA - Book Lung glandular epithelium from an orb-weaving spider.ABDOMINA - Internal anatomy of a spider abdomen.FIN II - High magnification portrait of a fish fin.FIN - Portrait of a fish finFLIGHT - B/W Mosquito wing portraitLEG - B/W portrait of a Mosquito legSENSORY - B/W portrait of Mosquito antennaeTROPHOCYTES - Abdominal fat bodies from a female mosquito.MUSCULARIS - Flight muscle,connective tissue and abdomial fat bodies from a Mosquito.3DC - Cartilage Cells 185 - Osteons, osteocytes and blood vesselsADIPOSE I - High-magnification portrait of cytoplasm of adipocytes with peripheral nucleiADIPOSE II - Low-magnification portrait of cytoplasm of adipocytes with peripheral nucleiANOMALY - Calcified cartilage, trabecular bone and marrowANTIGENICITY - Portrait of chondrocytes undergoing physiological cell death (apoptosis)ARCHAEOMETRY - Cortical bone haversian systemsARTICULAR - Articular cartilageBIOMINERAL - Trabecular bone and bone marrowBLUE - A portrait of incisor autofluoresenceBLUSH - Bone, osteoid and marrowBRANCHES - Degrading bone marrow and trabecular boneCASCADE - Calcified cartilage,trabecular bone and osteoblastsCHROMATIC - Trabecular bone & marrowTHE COAST - Bone marrow, endosteum & cortical boneCORTICAL - Cortical bone with marrow coreDAMAGE - Ruptured patellar tendon inserting into a tibiaDENSITY - Single trabecula surrounded by marrow and sinusoidsDENTIN - Interior of an incisorDISTAL - Distal end of a murine femurFASCICLES - Peripheral nerve fasciclesFATIGUE - Damaged flexor tendonFIBRA - A portrait of muscle fibersFILAMENTS I - Fish gills attached to ligamentFILAMENTS II - A portrait of individual fish gillsFIRE - Osteoid fluorescenceFISSURE - Fissure in cartilageGALAXY - Trabecular bone under epi-illuminationJUVENILE - Developing trabecular bone and marrowGEOMETRY - Portrait of osteons & osteocytesGRAIN - Osteocytes and blood vesselsGRANULATION - Collagenous scar tissueFRACTURE - Portrait of a healing fractureGRAVITATION - Bone marrow and cortical boneINSERTION - High-magnification view of a tendon insertionINTEGRATION - Tendon, articular cartilage, fat, bone & marrowJUNCTION - A portrait of epiphyseal ossificationKALEIDOSCOPE - High-magnification portrait of osteonsLAGUNA - Bone marrow core in cortical boneLANDSCAPE - Growth plate, trabeculae & marrowLINO - Portrait of skeletal muscleLUMIERE - Portrait of tendon and articular cartilage connectivityMAXILLOFACIAL - Head and thorax muscle structure of an American cockroachMETALLURGY - Growth plate trabecular bone and marrowBUNDLE - Developing fibrocartilage clusterMINERAL - Mineralized trabecula (highlighted with silver nitrate) surrounded by marrowMINERAL-II - Mineralized trabecular (highlighted with silver nitrate) bone surrounded by marrowMINERAL-III - Mineralized trabeculae (highlighted with silver nitrate) and marrowMOELLE - Portrait of bone marrowMOLAR - The interior of a molarMUSCLE SQUELETTIQUE - Skeletal muscle autofluoresenceNETWORK - A portrait of osteonsORBIT - Inside the head of a beetle with compound eyeOSSIFICATION - Calcified cartilage cores in bone matrixOSTEOANIMATION - Trabecular bone and marrow autofluoresenceOSTEOLOGY - Cortical bone haversian canalsOSTEONS - High-magnification of osteonsPATELLAR - Patellar tendon inserting into a tibiaPODS - Bone marrow and trabecular boneFIBRILS - Developing collagen fibrils and cartilagePROXIMAL - Portrait of the proximal end of a murine femurEXOSKELETON - Head and thorax exoskeleton of an American cockroachROOT - Ligament in alveolar boneSATELLITES - Osteocytes in bone matrixSEAMLESS - Flexor tendonSHEAR - Tooth, bone and supporting connective tissue from a piranhaSKULL+ MUSCLE - American cockroach exoskeleton & muscle under polarized lightTHORNS - Cockroach femur/tibia articulation and leg sensillaTIDEMARK - Tendon, articular cartilage and boneTIMBER - A portrait of Volkmann's canalsTRANSITION - Fibrocatilage transitioning into tendonVISION - The compound eye of a beetleINTERLACE - Developing cartilage and collagen fibrilsWEB - A portrait of vessels and adipose tissueWAVE - Fibrocartilage portraitSTRENGTH - Transverse section of skeletal muscleJUXTAPOSITION I - Lamellar bone and granulation tissueJUXTAPOSITION II - Lamellar bone and granulated bone marrow Biology Terms: Adipose tissue - Fat tissue composed of adipocytes (fat cells). This tissue stores energy and provides insulation.Alveolar bone - A type of cortical bone that forms the tooth socket and surrounds the tooth root on tooth-bearing vertebrates.Apoptosis - A form of physiological cell death requiring metabolic activity by the dying cell. Apoptosis is the opposite of necrosis (pathological cell death).Articulation - A junction between two or more components.Autofluoresence - A material or component (in tissue) that will fluoresce on it’s own without an external fluorophore.Biological dye - Molecules that exhibit attachment specificity. Dyes give color and contrast to different components in tissue based on a variety of biochemical factors.Bone - A mineralized connective tissue that forms the endoskeleton of vertebrates.Calcification - The process of mineral salt deposition in tissue.Calcified cartilage - A type of cartilage in which mineral salts have been deposited.Callus - In the bone healing process, a cartilaginous (hyaline) callus is formed is around a fracture during the reparative stage to facilitate healing.Canaliculi - Small canals in bone whose purpose is to transfer fluid in bone. Canaliculi are a part of the osteocyte.Cartilage - A unique, complex connective tissue made up of collagen and elastin. This tissue provides the origins of bone growth and provides the smooth surfaces for joint movement.Chitin - A naturally occurring, abundant polysaccharide. This polymer is partly responsible for forming the exoskeletons of invertebrates.Chondrocyte - The principle cell of cartilage tissue. This cell is responsible for the production (and maintenance) of the cartilaginous matrix.Collagen - The principle protein (organic compounds composed of amino acids) in organisms. Collagen is the major component of connective tissues.Compound eye - The sight organ of invertebrates. This type of eye is formed of numerous photoreceptor cells. The number can vary from one to thousands depending on the organism.Coronal - The frontal plane division of a structural body.Cortical bone - A dense osseous tissue found on the surface (outer layer) of bones.Dentin - The core material of which teeth are comprised. Dentin lies beneath enamel.Epiphysis - The rounded area of limb bones normally filled with red marrow.Epitope - A large molecule, which recognized by the immune system and reacts with antibodies.Exoskeleton - The external support and protective covering of invertebrates. Composed of polysaccharides and other proteins.Fascicle - A small cluster of nerve fibers.Fibrocartilage - Fibrocartilage is a \"hybrid\" tissue consisiting of dense,parallel collagen fibers and cartilage.Filament - As a defined in ichthyology (study of fishes), gill filaments are complex structures that facilitate blood flow in bony fishes.Fissure - A linear grove or crack resulting from injury.Fluorophore - In dye chemistry, a Fluorophore is the particular element in a stain that fluoresces or an endogenous element in a specimen that will naturally fluoresce at a particular wavelength.Fracture - A disruption in continuity of a bone resulting from injury or trauma.Growth Plate - Also know as the epiphyseal plate. The growth plate is a layer of cartilage that divides the epiphysis from the metaphysis in limb bones. This area is where bone growth occurs.Haversian system - Another term for the mature cell in bone called the osteon. The haversian system is a cylindrical structure composed of circular layers of bone and is central to blood vessel function and nerve cell communication in bone.Histochemistry - The study of biochemistry of tissue.Histology - The study of tissue or tissue sections.Hydroxyapatite - Inorganic mineral found in bones and teeth. Hydroxyapatite is composed of calcium and phosphate ions.Incisor - Front teeth located in the upper and lower jaw.Invertebrate - Any organism lacking a spine.Joint - A point at which two structures make contact and permit movement.Lamellar bone - Mature bone distinguished by layers of collagen fibers running in different directions.Ligament - A fibrous connective tissue that connects two or more structures together.Longitudinal - The long axis of a structure.Marrow - A fatty hematopoietic (blood) organ/tissue that fills the cavities of bones. There are two types of marrow: Red and Yellow.Matrix - The ossified, intercellular substance that makes up bone tissue.Maxilla - The upper jaw in vertebrates or part of the upper mouthparts in insects.Microanatomy - The branch of anatomy concerned with the minute structures of animals or other organisms.Minerals - Inorganic substances found in the body.Molar - A complex rear tooth located in the upper and lower jaws in the majority of mammals.Muscle - A voluntary (skeletal) or involuntary (cardiac & smooth) contractile tissue in vertebrates. In insects there are two types: Synchronous and Asychronous.Muscle serves to produce force and/or cause motion.Necrosis - Pathological cell death resulting from trauma, injury or infection.Nerve - A bundled structure composed of multiple cable-like fibers.Nuclei - The main structural element of a cell (plural: Nucleus).Ossification - The process of bone formation.Osteoblast - The cell responsible for bone formation.Osteoclast - The large, multi-nucleated cell responsible for bone turnover or resorption.Osteocyte - The mature cell of bone located in the mineralized bone matrix.Osteoid - A proteinaceous substance secreted osteoblasts. This substance is important in the mineralization process.Osteon - The central unit of compact bone and the center of the haversian system.Patella - The kneecap bone.Peripheral nerve - A nerve structure that lies outside or adjacent to the central nervous system.Sagittal - Anatomical term for symmetrical left and right division of a body.Sensilla - Specialized sensory hair-like structures on the body of insects.Silver nitrate - Silver nitrate is used to highlight phosphate and carbonate anions in mineralized sections of tissue. Chemically reduced silver ions produce black deposits in calcified sites.Sinusoids - Small blood vessel structures found in bone marrow and other organs.Skeletal muscle - A type of muscle known as “voluntary”. Skeletal muscle is distinguished by its striated appearance.Tendon - A tough connective tissue composed of densely packed collagen fibers. Tendons connect muscle to bone and enable movement through contraction transfer.Tenocytes - The tendon cells responsible for collagen fibril production.Trabecular bone - A type of bone tissue found in the interior of limb bones. It is distinguished by its compressive properties and lattice-like structure.Transverse - Anatomical term for the horizontal plane through a body.Vertebrate - Organisms that possess backbones ore spinal columns.Volkmann's canals - The lateral branches of Haversian Canals that permit blood vessel communication between osteons. Microscopy Terms: Aperture - Describes a lens opening in light microscopy.Brightfield microscopy - In light microscopy, both diffracted and undiffracted radiation from the specimen sample and its immediate environment is collected by the objective lens to form an image on a bright background.Color - In microscopy, color is perceived through a coordinated physiological response of the eye and brain to stimulation of the retina by one or several wavelengths in the visible spectrum of light.Compound light microscope - A microscope that has dual image forming optical elements and uses visible light as its source of illumination.Darkfield microscopy - A method of illumination that illuminates the specimen sample, but does not let light directly into the objective. Specimen samples appear bright against a dark background.Differential interference - A type of light microscopy that utilizes specialized filters and prisms. This type of microscopy is used to visualize and add contrast to transparent specimens.Epi-fluorescence microscopy - A type of fluorescence microscopy that utilizes epi-illumnation. Using filter cubes that select excitation wavelengths and directs this wavelength light onto the tissue sample.Epi-Illumination - Incident illumination of an object.Excitation - In microscopy, this refers to the releasing of energy from molecules as particles of electromagnetic radiation termed photonsFilter - An optical device that separates components of light or radiationFluorescence - Light emission at long wavelengths by a specimen as the result of absorption of a shorter wavelength. Some form of stimulation irradiation must trigger this phenomenon.Fluorophore - In dye chemistry, a Fluorophore is the particular element in a stain that fluoresces or an endogenous element in a specimen that will naturally fluoresce at a particular wavelength.Illumination - Wavelengths of light (radiation) falling on a sample.Lens - An optical device that focuses, modifies or otherwise changes a path of light.Light microscopy - A type of microscopy that uses visible light as its source of radiation.Magnification - The process of enlarging the dimensions and features of a sample.Microscope - Any device that that produces a magnified image of a specimen or sample.Numerical aperture - The value assigned to a lens based on its light-gathering and resolving abilities.Objective - The multi-element image-forming lens of a light microscope.Photomicrography - A type of photography where a microscope is used in conjunction with a camera to capture an image.Photon - A particle of electromagnetic radiation.Polarized light - A type of light in which the waves vibrate either in one plane (plane-polarized, circularly or elliptically. Polarized light is useful in assessing mineral homogeneity.Polarized light microscope - A light microscope that has been outfitted with the optical accessories for polarized light microscopy. About: photomicrographTechniqueThe process of creating my photomicrographs begins with the complicated and meticulous process of specimen preparation. The first step in this process begins with fixation. Tissue samples are carefully stabilized through a chemical process called "fixation" that prevents enzymatic breakdown and preserves structure. Depending on the sample, a variety of fixatives are utilized in this process including: Aldehydes, Oxidizers and Coagulants. The second step involves the removal of free-water from the tissue. This process is called dehydration. Hydrophilic solvents (such as alcohols) are used to dehydrate samples. After dehydration, samples undergo a multi-stage infiltration process with a custom acrylic compound. The acrylic/specimen is then polymerized. Once the sample has polymerized, a very thin section is cut from this polymerization. The section thickness may vary depending on the application. However, on average, no section will be thicker than a standard sheet of paper, approximately 0.1 millimeters (100 micrometers) in thickness. Section samples are then mounted to glass slides or fused to opaque acrylic plates for staining with biological dyes or may be left unstained. The last step(s) involve section imaging using a compound optical microscope and photography. A number of imaging techniques such as: Standard Brightfield Microscopy, Differential Interference Contrast, Polarized Light and Fluorescence Microscopy are employed to highlight structure. Sections are then photographed using a film or digital camera attached to the microscope. All of the images in this collection are natural representations of microstructure and have not undergone any digital reconstruction.photomicrographPrintingAll Damien Laudier photomicrographs are original, editioned works of the artist. Prints are titled, dated and signed on verso. Each photomicrograph comes with an edition notation and detailed description of microanatomy and the microscopy technique(s) used to capture the image. Unless otherwise noted, prints are matted with an 8-ply, acid-free, museum quality mat and backing board. *Print shipping is provided free of charge. Cibachrome: Also known as the Ilfochrome®, Ilford Photo introduced this silver-dye bleach process in 1963. The high-gloss paper is capable of producing spectacular sharpness and color resolution. A Cibachrome can be produced from an original transparency or a digital file. The Cibachrome is considered by experts to be the "ultimate color print". Chromogenic Print: (C-Print) A exhibition quality, color or monochrome print, made from a negative or digital file (Digital C-Print); using three separate emulsion layers of color sensitized silver salts. Endura Metallic: A proprietary product created by KODAK. Base paper is produced with a glossy silver coating rendering prints that have an exceptional, uniquely three-dimensional image. Silver-Gelatin Print: The common term for traditional black and white prints. Traditional black and white prints are printed on paper coated with silver salts. Platinum-Palladium: A contact printing process that uses no gelatin-emulsion. Instead, prints are made from the noble metals of platinum and palladium. Invented around the late 1800's, platinum prints are uniquely beautiful black and white prints, providing lush, rich, full-range tones unobtainable with silver-based prints. Platinum prints are also the most permanent type of black and white photographs. 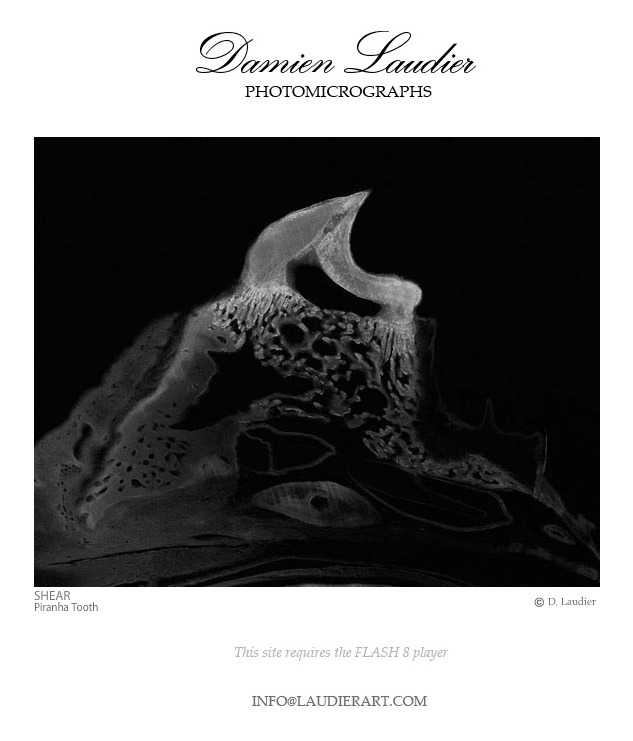 damienLaudierDamien Laudier has had a life-long fascination with biology and art, particularly photographic art. He became interested in microscopes and microscopy technique at very early age; this interest continued and flourished throughout his academic training. His biology career started in forensic science, and over the years has passed through such diverse fields as entomology, neurobiology and paleontology. Damien Laudier is currently recognized as one of the preeminent musculoskeletal histologists in the field, and a recognized specialist in insect and related invertebrate histology. His photomicrographs have been widely published in prominent science journals and featured in several monographs. Although his photomicrographs have been used primarily for scientific purposes, he desired to bring his images to a larger audience outside the scientific community, believing strongly in their aesthetic as well as educational value. Damien Laudier Photomicrographs will be on display at the Paris Entomology show September 28-29,2013.